Definition: Oxidative stress reflects an imbalance between the systemic manifestation of reactive oxygen species and a biological system’s ability to readily detoxify the reactive intermediates or to repair the resulting damage. Free radicals are oxygen-containing molecules with an uneven number of electrons. The uneven number allows them to easily react with other molecules. Free radicals can cause large chain chemical reactions in our body because they react so easily with other molecules. These reactions are called oxidation. They can be beneficial or harmful. It occurs when excess oxygen radicals are produced in cells, which could overwhelm the normal antioxidant capacity. When the concentration of reactive species is not controlled by internal defense mechanisms such as antioxidants (tocopherols, ascorbic acid, and glutathione) or enzymes involved in oxygen radical scavenging (catalase, peroxidase, and superoxide dismutase, SOD), oxidative damage occurs to proteins, lipids, and DNA, which could lead to cytotoxicity, genotoxicity, and even carcinogenesis when damaged (mutated) cells can proliferate. Risk factors of Oxidative stress: Oxidative stress leads to many pathophysiological conditions in the body. 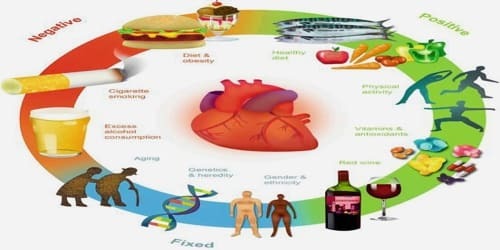 Some of these include neurodegenerative diseases such as Parkinson’s disease and Alzheimer’s disease, gene mutations and cancers, chronic fatigue syndrome, fragile X syndrome, heart and blood vessel disorders, atherosclerosis, heart failure, heart attack, and inflammatory diseases. 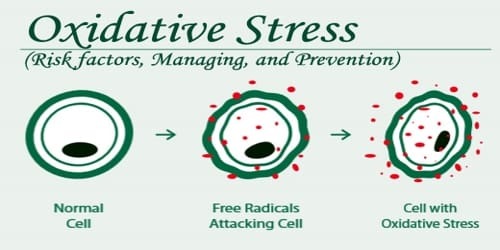 Managing and Preventing Oxidative stress: Oxidative stress is caused by ROS (reactive oxygen species) which are very reactive molecules that damage our cells by reacting with all sorts of other molecules like DNA and proteins. Usually, cells can hold the ROS under control with specific proteins and antioxidants. In order to supply our cells with these substances, we need to eat the right foods and nourish our body accordingly. It’s impossible to completely avoid free radical exposure and oxidative stress. However, there are things we can do to minimize the effects of oxidative stress on our body. One method of preventing oxidative stress is to ensure that people are obtaining enough antioxidants in their diet. Eating five servings per day of a variety of fruits and vegetables is the best way to provide their body what it needs to produce antioxidants. Antioxidants hold down ROS by counteracting them. Unfortunately, antioxidant supplements have not been proven to reduce oxidative stress because many studies have had different results. 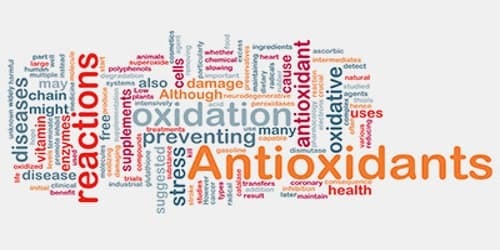 The relation between antioxidant levels and oxidative stress is clear (more antioxidants means less oxidative stress) and the consumption of antioxidant-rich foods like fruit and vegetables has been shown to reduce oxidative stress related problems it is safe to say that getting our antioxidants from natural food is necessary. The most well-known antioxidants are vitamin E, carotenoids, vitamin C, flavonoids, mannitol, riboflavin (vitamin B2), aminoguanidine, resveratrol and pyridoxine (vitamin B6). Studies have shown that overeating and constant eating keep our body in a state of oxidative stress more often than if we eat at appropriately spaced intervals, and eat small or moderate portions.